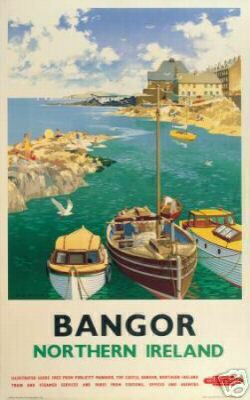 In 1836, Bangor was described as having 550 houses which were built of stone and plastered,whitewashed or otherwise coloured; most with slated roofs but some thatched. The most noticeable objects when entering the town were the high church spire and Bangor Castle. There were two large cotton factories with their smoking chimneys and a corn mill giving the town as a whole a manufacturing, crowded and dirty appearance. The average number of people in a family was 5 and their usual food was potatoes, meal and bacon or salt beef when the latter could be afforded; they were considered luxuries. There were four churches in town; Church of Ireland, 2 Presbyterian and one Methodist. The Market House in the centre of town was a small building, recently erected by Lord Bangor and Colonel Ward. 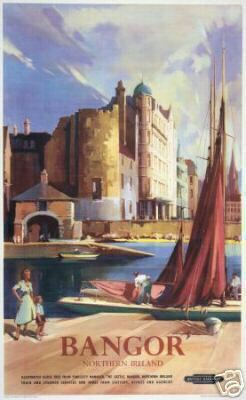 Bangor was a municipal town with the corporation consisting of a provost and 12 burgesses. The people were mainly shopkeepers or worked in the cotton factory. There was a library with religious and moral books, a savings bank, a mendicity institution and poor house and five schools. No markets were held in town but there were three fairs during the year. There was a dispensary in town which saw about 700 people a year, mainly with scrofula, which was said to be brought from Scotland. There was a coastguard with 5 men and an officer and 2 policemen. The harbour, as seen above, was ' very bad'. At low water it was completely dry. There was only one pilot in town, who was connected with an insurance company and whose job it was to get the vessels safely out of the harbour. 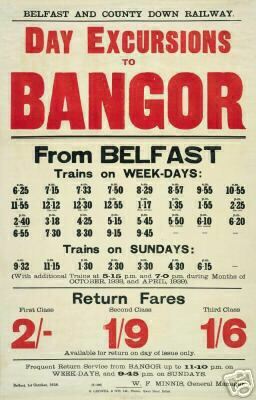 In 1846 the parish population was 10,060 with 3166 people living in Bangor town. In 558 AD, St. Comgall founded a monastery near this site. From the 9th century, a university was here but was constantly attacked by Vikings. 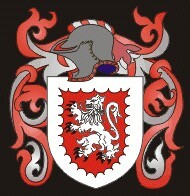 St. Malacy was appointed abbot in 1124 & built the church. 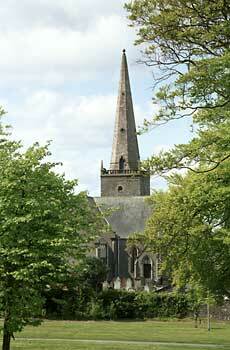 It was rebuilt 13th century but the tower is 15th century & a spire was added in 1693 The minister in 1824 was Rev. George Armstrong. (POD). 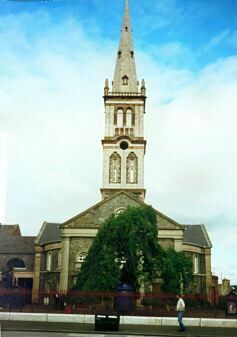 The church was closed in 1882 in favour of the new,larger Church of Ireland in th south of the town before being renovated in 1917.